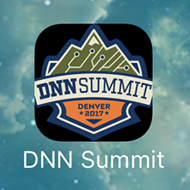 We are excited to announce the availability of the official DNN Summit Denver 2017 mobile app in both Google Play (for Android devices) & the Apple App Store (for iOS devices). That’s right, the DNN Association continues our efforts to provide the DNN Community with a first-class conference and the availability of this app is another example of our efforts. 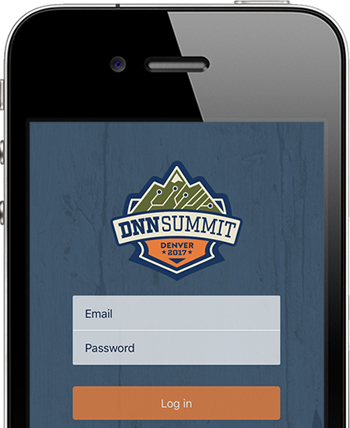 We think the app will improve everyone’s experience at DNN Summit! After several beta versions we wanted to publish a basic version of the app to get acquainted with the process for publishing apps across multiple stores. We’ve learned a lot about the submission process that will help speed up our delivery of future versions of the app, which are coming soon. As with any app there must be functionality that makes it useful. 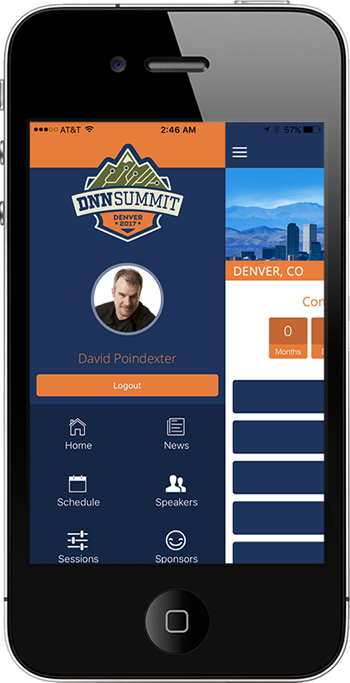 The DNN Summit mobile app has several features which will be helpful for users participating from afar, attendees of the conference, and conference administrators. In the initial release of the app there is a conference count-down clock on the home page. The app also pulls in the blog section of this website into the news feed area of the app. The entire DNN Summit schedule is present along with conference day specific info on speakers and sessions being available as well. All event location info is present which makes event venues easier to find as users can simply click the address and open their maps app. The app has a well-designed UI, is aesthetically pleasing as the colors match the DNN Summit branding, is very responsive, and is a great first step… but wait there’s more! As aforementioned, the initial version of the app is intended to be somewhat basic in nature. 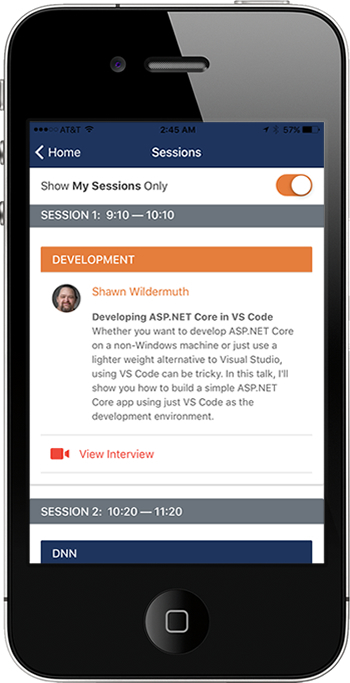 Future releases of the app, which are scheduled to happen before the conference, will include a live chat feature to keep everyone connected real-time, speaker video interview integration, conference survey integration, enhanced UI/UX for speakers and session info, a way for users to select their favorite sessions, and user authentication. Also, we know it is impossible for you to experience all that is going on simultaneously at DNN Summit, so following along via the new social feed will be sure to help! As you can see, the next versions of the app are going to bring in some awesome functionality! You may be reading this blog entry and are wondering the obvious – how is this being done? How is info being pulled from the DNN Summit back-end and integrated so seamlessly into an app? What is the back-end of the chat? How is it so responsive? If you are wondering about these type of questions, then we have some good news for you - this information will be discussed at DNN Summit. All you have to do is attend David Poindexter & Matt Kremer’s session “Mobile App Development Using Ionic + DNN” and you’ll learn about the secret sauce behind the app! So now that you are aware of the all the goodness, we hope you’re ready to go and get the app. We are making that easier for you by providing direct links to the app. Next Article DNN Summit Awards & Give-Aways to Anticipate!